A young Syrian journalist carries a camera and a gun to protect himself on Feb. 9, 2014 in a street in the northern Syrian city of Aleppo. The Syrian conflict is now well over four years old. It has evolved from a peaceful protest movement to an armed rebellion, to a multi-front civil war. In the last year especially, the Islamic State has risen to prominence, claiming large parts of the country and becoming a household name the world over. That has prompted international intervention. The conflict could not be more complicated. Millions of Syrians are displaced and seeking assistance from reluctant neighbors. Their country has become a proxy battleground for competing powers and groups. News from inside Syria matters to publics all over the world and impacts decisions made by foreign governments. The story of the war — now spilling over borders into Iraq, Turkey, and elsewhere — needs to be told, and told accurately. The problem is this: It has become nearly impossible to report accurately from inside Syria. It's too dangerous. The Syrian conflict has now claimed the lives of more than 80 journalists in the last four years, according to the Committee to Protect Journalists (CPJ). That makes it the second-deadliest place for reporters after Iraq. More than 160 journalists have been killed covering conflicts in Iraq since CPJ began counting in 1992, almost all of them after the American invasion in 2003. There is little doubt that if the Syrian conflict persists, it will surpass Iraq as the deadliest country for reporters to work. Some of the most important reporters in the world right now are Syrians still inside their country who take extraordinary risks to send information to news organizations on the outside. "Global attention has focused on the abductions and murders of international journalists in Syria, but even as the environment has deteriorated for foreign correspondents, local media have suffered tremendous losses," said Maria Salazar-Ferro, coordinator of CPJ's Journalist Assistance program, in a statement. "Facing the same or greater risks as international correspondents, but without an easy path out of the country, Syrian journalists have been forced to leave their jobs and are driven into hiding or across borders, often without family or possessions." It wasn't always this way. In the early days of the conflict there were still even Western journalists based in Damascus, Syria's capital. They were reporting relatively freely, with legal visas to work. But as the Syrian government, led by President Bashar al-Assad, began to violently crack down on protesters in April 2011, the mood quickly changed. Sensing the danger, most foreign journalists based in Syria left. In the years that followed, a cadre of both seasoned war correspondents and daring freelancers began to make short trips into the country to report. Most of them embedded with the Free Syrian Army, mirroring a strategy foreign reporters used in other Arab Spring-style conflicts like the one in Libya. Journalists were still being killed, including some veterans of conflict reporting. Covering war is never safe. But most felt the rebels could provide some relative protection. And they could, for a time. Then the rebels themselves became fractured. Foreign fighters with a variety of agendas began to flood the country, and with them came the rise of competing extremist groups. Kidnapping became a big business. All hell soon broke loose. Assad's forces were bombing whole cities into oblivion, with little regard for civilian life. The death toll continued to soar. It was no longer safe with the rebels. And it certainly wasn't safe with the forces loyal to the Syrian government. It definitely wasn't safe with the extremists. As a result, just two years into the conflict, many news organizations pulled out almost entirely. A number of foreign journalists were being held hostage inside Syria at that point, including James Foley. On Aug. 19, 2014, the Islamic State released a video online showing Foley's horrific execution. Foley was an American journalist who had reported for GlobalPost from Afghanistan, Libya and Syria. The image of him kneeling in an orange jumpsuit with a knife to his throat shocked the world, and concluded a terrible two years of captivity during which his family and others had worked daily to secure his freedom. More beheadings would follow, targeting foreign journalists and aid workers held hostage. Several foreign hostages remain in the custody of the Islamic State today. The Islamic State characterized Foley's murder as retaliation for US airstrikes inside Iraq which had started up only days earlier. Soon after his killing, the United States expanded its airstrikes against IS into Syria. By the time Foley was killed, most foreign news organizations, GlobalPost included, had stopped working with journalists there. 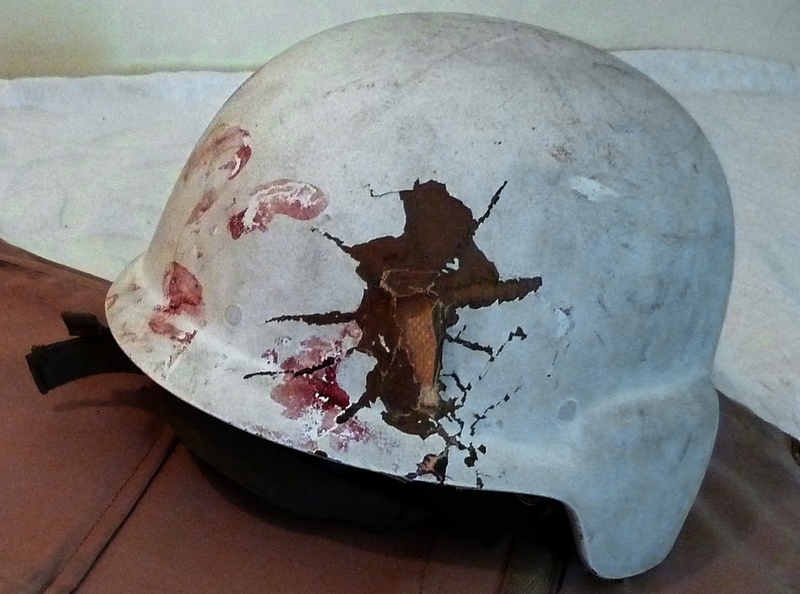 A blood-stained and shrapnel-riddled helmet belonging to a freelance video journalist who was injured while reporting from the Syrian city of Aleppo is seen in Antakya, Turkey on Aug. 24, 2012. These days most reporters attempt to cover the conflict from outside the country, along its borders in Lebanon, Iraq and Turkey, relying on many sources inside that few know for sure they can trust. There is actually no shortage of information coming from Syria — just a shortage of information that is reliable and independently verified. Numerous videos circulating online claim to show atrocities, for instance. But enough of them are fake (or from other conflicts) to throw every video into doubt. Accurate or not, this information can have a huge impact on the war. There have been numerous claims of chemical weapons attacks over the years of conflict in Syria. But experts and governments have found it difficult to confirm without doubt that these attacks violate the Chemical Weapons Convention, or were even carried out by the Syrian government. Tracey Shelton, a GlobalPost reporter, managed to get to the scene of one of these possible chemical attacks in April 2013. Everything she found — mysterious canisters, victims suffering from injuries that might indicate the presence of a chemical, claims by local doctors — pointed to a chemical weapons attack. But further analysis proved there could have been any number of explanations for the symptoms. Shelton wasn't able to stay long enough to fully investigate. If she could have proved that a chemical attack had happened, there was a chance that Obama — who, faced with a war-weary public, had thus far avoided intervening in the Syrian conflict — would have started considering on-the-ground military options. Today, the Syrian conflict is more tangled than ever. Turkey has joined the fight against the Islamic State in northern Syria, but is also bombing positions belonging to Kurdish forces. The Kurds have been one of the most effective forces on the ground against the Islamic State, and have been a key US ally in this particular conflict. Kurdish forces were also one of the groups Western journalists felt most safe embedding with on their reporting trips inside Syria after the FSA began to splinter. No more. It's hard to imagine that journalists will be able to overcome these dangers any time soon. And that means, for the foreseeable future, this conflict will evolve far from the eyes of the global public. That could have any number of dangerous consequences. Meanwhile, the death toll climbs: More than 210,000 people have lost their lives. Millions have lost their homes. And it's the stories of those who have made it out of Syria that journalists are most able to tell.